This has been a big week for me. I started school and finished the “Guidance Mandala”. Both of these occurrences may seem commonplace, but they represent rather notable milestones for me. My college career will start slowly, with two courses, one sorely needed at this time, a stress management course titled, “The Mindful Art of Self Compassion”. Already it is apparent to me the wounds inflicted by my harsh self judgment, as was pointed out in class, many of us speak to ourselves in a cruel tone that we would never use toward another. I look forward to adding self compassion to my life management tool box. After several months of analysis paralysis, I continued the “Guidance Mandala” in the only way that made sense to me, after so many other design options failed to satisfy. 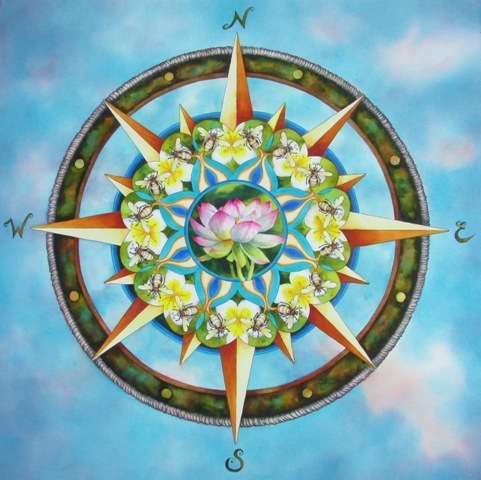 The compass is a complete departure for me and this mandala looks different to me than all previous creations. I am not comfortable with it visually, but it makes complete sense to me in other ways. The very center features the lotus, a symbol of awakening and peace. It represents stillness, the spirit, soul consciousness, as I have mentioned before, “be still and know”. The bees are representative of the mind, always busy, building, connecting, creating, surviving. The compass is very solid, the physical body component, the real world, reality, direction as received from the world that surrounds us. Body, mind and spirit, all three necessary for the current life experience. As a Phoenix native, Vikki Reed's vibrant watercolors of desert botanicals evolved from her love and appreciation of the desert's ability to produce tender beauty in the midst of harsh conditions. The mandala series which began in 2004 resurrects a childhood knowledge that mandalas are a primordial tool for centering and healing. Vikki studied in the 1980s with watercolor greats Irving Shapiro and Paul Kuo, and began exhibiting at the outdoor shows in Arizona, Nevada and New Mexico after Paul's encouragement. This led to gallery representation with the Wickenburg Gallery and Work of Artist's Gallery. Vikki also exhibited at the Celebration of Fine Art for eight years. Before taking sabbatical to act as caregiver for her father in 2010, Vikki was featured in a one woman show at the Northern Trust Bank in January 2008 and was selected to create an ornament for the White House Christmas Tree that same year. Vikki's current focus, the Mandala Series, combines ancient symbolism and the healing power of color. You are able to put feelings into words so well. I wonder if you’d ever consider a creative writing class. The frantic pace of life today leaves little time for contemplation, and yet, the greatest clarity and deepest truth can be found by taking time to look within, "Be Still and Know", if you will… Painting has always been my way to find that clarity, and mandalas were the method to create order out of chaos, even as a child. The powers of color and line are evident for me in what is created when I show up in the studio with a willing heart and ready hands. I am consistently amazed and gratified by the generosity of creative energy flow. It is my mission to share what I believe to be life-enhancing, spirit expanding imagery. I feel a responsibility to travel regularly to the mythic, and bring back pieces of the puzzle, in the form of art. These pieces help the collective return to wholeness, (which is what the mandala symbolizes). There is, I believe, healing ability in color tone, just as there is in musical tone. I seek to combine the elements of color in my work, whether mandala or botanical, in such a way as to maximize the benefits of this effect. My palette has evolved over time to include very vibrant hues. Mandalas can and will hold space for any viewer seeking healing opportunity. I paint with the intention that the wholeness each one of us seeks is available and waiting, quietly reassuring, "Be Still and Know…"